Let's start with the former Lord Commander. Without a beard he looks more like Lancel Lannister with a dye job than any kin of Ned Stark. And how about his buddy, Tormund Giantsbane? With a beard he's everyone's favorite throat-chomping, wall-climbing wildling. Without a beard, he kind of looks like Dave Mustaine with the jawline of a hockey goon. A serious beard like that could use a little help toughing out the elements and staying soft. Next is Tyrion's former sellsword and would-be lord Bronn, who now pals around with one-handed Jaime Lannister. Without a beard he's your uncle Jimmy who still shaves because he never stopped wanted to be Paul Newman even though he never had the looks. So speaking of Tyrion, let these pictures speak for themselves. Didn't anyone ever tell you great things come in small packages? And then there's Jorah the Andal, who goes from earnest warrior to foppish dandy with a few strokes of the razor. Yabba dabba — dude — are you serious? King Robert Baratheon was Fred Flinstone? It's a wonder he has such a thick beard (though it could use a good brushing) when he didn't even manage to get Fred's 5 o'clock shadow right. But one of these pictures looks like a kind and the other looks like an overgrown 12 year old. You decide. Last but not least is Petyr Baelish, Littlefinger himself. Clean shaven he's probably some poet coming to give a reading and sign copies of his latest work at the overpriced book shop in your little town. With that devious little Van Dike, he'll slit your throat for a chance to get one step closer to the Iron Throne. Not that that's a good thing, but at least he looks good doing it. Who's your favorite? Now, if you want to transform yourself or someone you love into a GoT heartthrob, you don't have to pay the Iron Price. 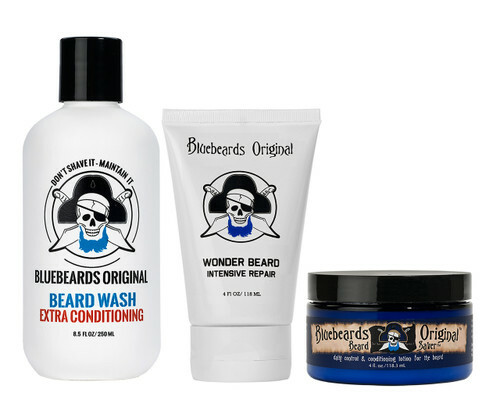 You can just grab a Bluebeards Original Trio (shipping's always free!) and begin your reign of awesome.